Regular readers of this blog probably know that, in our eyes, the posts we publish are more than mere reflections on events. Beyond the aspect of memorializing our daughter's life, we are engaged here in an impassioned and ongoing cry from the heart against terrorism and those who do it while drawing attention to its impact on the victims. None of these matters, we have learned from painful personal experience, is well enough understood. This is especially true of people holding high public office and those who advise them. We came back to this theme exactly a month ago to the day, in a post titled "11-Aug-14: Shalit Transaction revisited: At what point does facing up to the cost of a disastrous decision become unavoidable?" 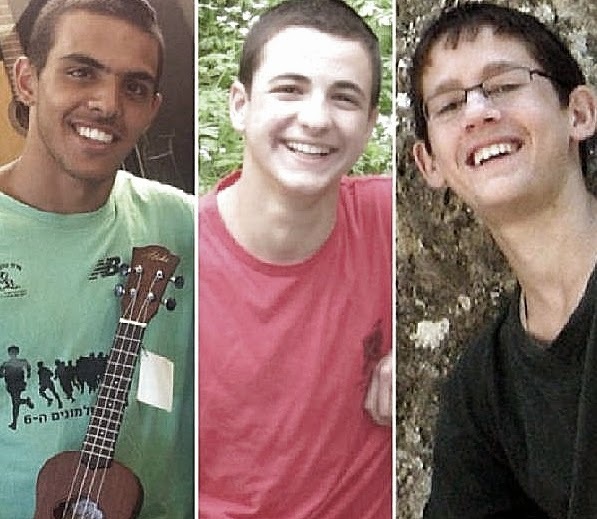 In it, we referred to three young Israeli yeshiva students - Naftali Fraenkel, 16, from Nof Ayalon; Gilad Sha'er, 16, from Talmon; and Eyal Yifrach, 19, from Elad. Their kidnapping, the search for their whereabouts and for those who snatched them from a hitch-hiking post at night, and the subsequent revelation of their cold-blooded murder, elicited deep concern, energy, unity and prayerfulness on a scale that was almost without precedent in modern Israel's history. A journalist, Avi Issacharoff from Times of Israel, had found, and we re-posted, that a central figure in that terrorist outrage, a man called Mahmoud Ali Kawasme is one of the Shalit 1,027. We noted that his premature and unwarranted release, like that of every other terrorist - including our daughter's murderer - freed in that deal at the time, was the result of a monumentally successful act of extortion directed against the Government of Israel. His freedom had been conditional on his being "exiled" to the Gaza Strip, and to his refraining from further involvement in terrorism. Instead, he became deeply enmeshed in the Hamas terrorist organization after walking from prison, eventually taking the role of funder and planner of the attack in which the three Israeli teens unwittingly accepted a ride in a stolen Israeli vehicle in which Palestinian Arab terrorists masqueraded as Jews at one of the roadside stops in the Jewish community of Gush Etzion. Two Arab men remain as of today the subjects of an ongoing manhunt for the kidnappings and murders. They are Marwan Kawasme - a member of the same clan as the ring-leader - and Amer Abu Aysh. 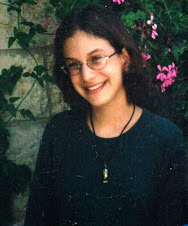 Issacharoff has today revealed further aspects of the same kidnap/murder. 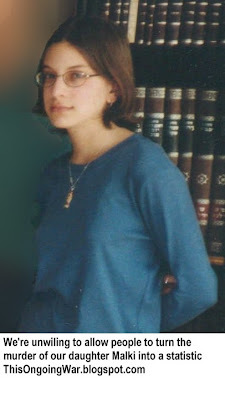 The abduction and murder of Sharon Edri. On September 9, 1996, the 20-year-old IDF serviceman disappeared after leaving the Tzrifin army base late at night en route to his home in Moshav Zanoah. Soon after his disappearance, the Red Cross offices in Gaza and Jerusalem received anonymous calls saying he had been captured and killed by Hamas. 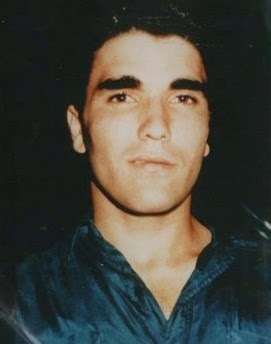 His body was found seven months later, in April 1997, near Zurif, the home town of this Ghaminat/Ghanimat/Ginat/Animat/Ranimat [2005 Ynet report]. 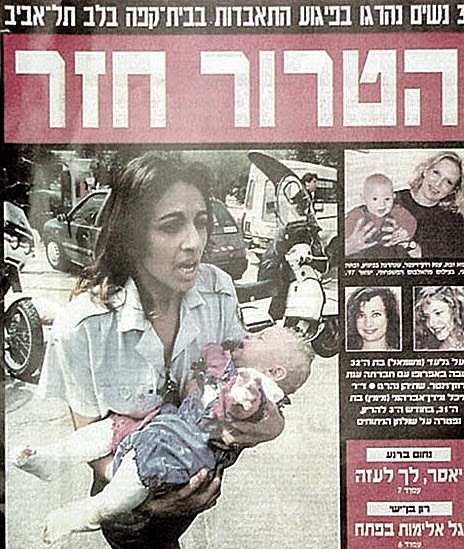 The human bomb attack on the crowded outdoor venue, Café Apropo in March 1997 on the eve of the Jewish festival day of Purim. Three accomplished young women - Michal Meidan-Avrahami, 32, a Wolfson Hospital radiologist, pregnant with her first child; Yael Gilad, 32, a social worker; and Anat Rosen-Winter, 30 year old lawyer whose 8-month-old daughter, Shani, was saved by her mother shielding her from the blast - were all killed in the attack. 48 others were injured. And several more lethal attacks on unarmed civilian Israelis. In short, a vicious and effective sociopath with much innocent blood on his hands. joined a special office under the Hamas military wing in Gaza, which operated under the leadership of the Turkey-based Saleh al-Arouri, one of the heads of the organization living in Ankara. The office hired several of the exiled prisoners to oversee the terror cells in the West Bank. Working from Gaza, Ghaminat was responsible for the Hebron area, along with another ex-prisoner released under the Shalit deal, Ayed Dodin, a Hamas man and resident of Dura, south of Hebron... Traveling through Egypt, the two also visited Turkey and Qatar more than once in the past two years to coordinate the Hamas schemes with Arouri, as well as with other political heads of Hamas living abroad. According to the Palestinian sources, Mahmoud Kawasme [the other Shalit Transaction graduate we mentioned above and here] worked under Ghaminat (sic) in Gaza. Had he remained behind bars (as Israel's legal system had determined he must) and not been given the priceless gift of undeserved freedom in 2011 by politicians, could this brutal man have engineered the murders of the three young men mourned by an entire grieving nation? Arising out of this, we make two requests. One: to understand how those of us directly impacted by Hamas terror feel our government ought to act, please consider this post of ours: "27-Jul-13: To defeat the terrorists, what one thing must a government never do?" And two: if you happen to be the Secretary of State of the United States or work for him (or he works for you), or if you belong to one of the hundreds of houses of worship affiliated with the World Council of Churches or belong to its management team in Geneva, please read this: "30-Jun-14: The message of the murdering terrorists, its logical outcome and the indispensable support that enables it". Everyone else is welcome, even invited, to pass these sentiments - and the posts in which they are expressed - to people about whom they care. Those who make large decisions in our lives must know that, on terrorism, they are getting them wrong too often. This, for those paying attention, is getting clearer with each passing day.